When the European Space Agency launched its Galileo In-Orbit Validation Element-A (GIOVE-A) satellite in 2005, its main mission was to transmit Galileo test signals that secured the system’s frequencies, evaluate hardware under space environmental conditions, and so forth. ESA formally decommissioned the spacecraft in the middle of 2012 after the agency had finished checking out the first Galileo in-orbit validation (IOV) satellites. The agency then moved GIOVE-A into a “graveyard orbit” about 100 kilometers above Galileo’s 23,222-kilometer altitude and passed control to the spacecraft’s prime contractor, Surrey Satellite Technology Ltd (SSTL) of Guildford, United Kingdom, which had designed and built the satellite. Part of the spacecraft’s equipage was an SSTL GPS receiver that ESA worked with SSTL to customize for testing on GIOVE-A, an activity supported through ESA’s Advanced Research in Telecommunications Systems (ARTES) program. However, that receiver was only activated for 90 minutes during the very beginning of the satellite’s seven-year operational life, with priority given to GIOVE-A’s main tasks. Now the receiver has come out of retirement to enable GIOVE-A to become the first civilian satellite to perform GPS position fixes from high orbit, according to ESA. GIOVE-A has been able to fix its position, velocity, and time from GPS signals, despite orbiting more than 1,000 kilometers (620 miles) above the orbits of the downward-pointing U.S. satellites. The results demonstrate that current GNSS signals could guide missions much further away in space, up to geostationary orbit or even as far as the Moon, researchers say. “Satellite navigation has become almost as indispensable for most low-orbiting satellites as it is for car drivers and other terrestrial users,” says ESA’s Steeve Kowaltschek. Satellites equipped with satnav receivers can continuously monitor their orbit in space, enabling largely autonomous operations with limited ground intervention. “GIOVE-A’s three months of data show that future geostationary satellites could operate in the same way, bringing real competitive advantage to the multi-billion-euro telecommunications satellite market,” Kowaltschek adds. 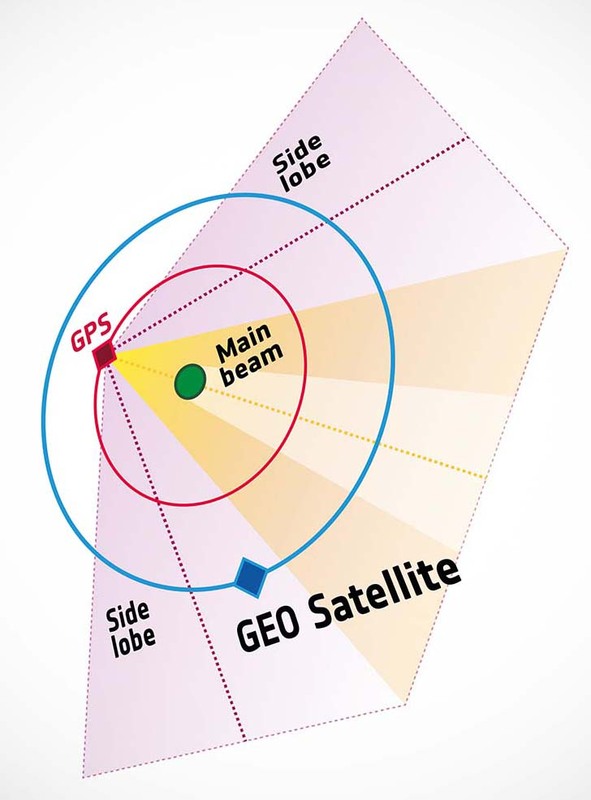 GPS satellites — like those of Galileo, GLONASS, and other GNSS spacecraft — aim their antennas directly toward the center of the Earth. Any satellite orbiting above the GPS constellation can only detect signals passing by the limbs or portions of the sky immediately adjacent to the Earth, while the majority are blocked by the planet. For a 3D position fix, a GNSS receiver needs a minimum of four satellites to be visible, but this is not possible most of the time if just using front-facing signals. However, just like a flashlight, radio antennas radiate a fraction of their energy to the side as well as the main signal that travels directly forward. GIOVE-A makes use of these “side lobes” to help track sufficient GPS satellite signals to accomplish a position fix. SSTL is able to upload new software to the receiver in orbit and has been able to apply sophisticated software algorithms to help detect faint GNSS signals. Further work is planned to refine operation through the use of an accurate onboard clock and orbit-estimating algorithms.